Back in 2004, during the Nokia Era, we have started as a small team of engineers who got together to develop J2ME apps. It was shortly after that we realized the hard way, that things do not just stop there, they actually start. I have then started to think about doing the mobile app marketing differently. My motivation was to replace the outdated marketing techniques with cost-effective and productive ones. driving downloads and engagement for your app calls for sometimes complicated and rather costly techniques, this is where we come in. We draw cost-effective methods that help your app reach users and engage with it, even if they haven’t downloaded it yet! Today we are happy to announce the release first solution for App developers marketing issues, Smart Deeplinks, a mobile deep linking service. They are links that take the user into different paths depending on the environment where the link is opened thus making the user move forward without breaking the experience. For instance, if a user clicks on a deep link that is supposed to take him/her to a specific section of an app, but that app has not been installed on this device, Then the user will get an error, and the user flow stops. By using a smart deep link, it would send the user to an alternative route such as the app store. Therefore, keeping a smooth experience for the end user and driving up new installs. 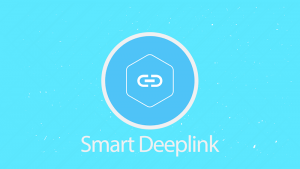 Smart deep link can recognize the device that is opening the link, and check if the app is installed before trying to send a user there. They also can take different paths if the app is not there. Do you want to see it in action? Well, let us do the magic for you, log in now and try it for yourself for free. Start your Free 30 Days trial!